Hit the ice playing Break Away and if the puck goes your way you have the chance to win $500 on a single spin. There are 5 reels and a whopping 243 paylines in this game where you can wager up to 2,430 coins on 1 spin. The betting range is from 50 cents to $50 so the game will appeal to low stakes players and high rollers alike. Players are able to enjoy this free slot here with no download. 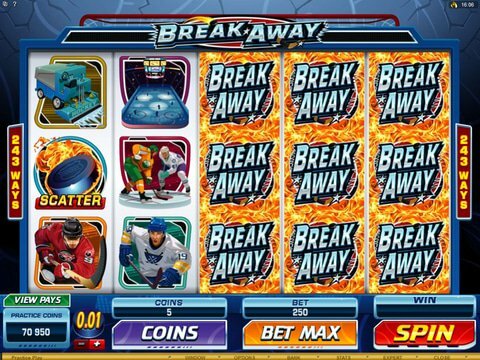 Break Away features a wild symbol, a scatter symbol, and free spins, but there is no multiplier and no bonus game. The hockey themed symbols in this free slot include a puck, a face off, a zamboni, an ice rink, a hockey player, skates, a goalie mask, and the Break Away logo. The Break Away logo is the wild and it not only acts as the wild, but if you get 40 of the stacked symbols you increase your chances for a HUGE payout. The faceoff symbol is the scatter and if you spin on them in the 2nd, 3rd, and 5th reel you will trigger the 25 free spins with various multipliers up to 10x. The graphics in the game are colorful and vibrant and the sounds will put you in the middle of the rink. Microgaming the software giant has done it again with this free slot. The interface is easy to navigate and all of the betting control symbols are located at the bottom of the screen. In order to win the top jackpot you have to click on the Bet Max button. One top online casino that you can play Break Away is All Slots. Canadian players are welcome, and will find a lucrative no deposit bonus waiting for them as soon as they are registered.